Having a good external battery charger is worth it. They come in different shapes and sizes so knowing what you want out of it is key. For me, my requirements was that it must be durable (Im a clumsy git), have two ports, be able to get a couple full charges out of it and not be too expensive. I settled on the Zendure A3. Its durable, looks pretty cool and I got it at a great price from Amazon. The Zendure A series is a great product, it is durable (survived a number of my clumsy moments) and its not a bad price. Would I chose this over my Mophie? Yes, because the Mophie is a battery wrapped in a pretty bow. One scratch and it just doesn’t look cool anymore. The Zendure is designed to be beaten up, scuffed, dented. Its ruggedness exudes a willingness to travel in hardship [although Im not…but its not about me!]. If you are in the market for an external battery to accompany you on your travels then I highly recommend the Zendure A-Series. Im writing about a bloody battery….!! Its always interesting (to me anyway!) to have something visual to represent your (in this case) travels. Below is a map of countries I have visited these last few years. Looking through my Tripit log I can see in excess of 100 seperate trips and 50+ different cities. If only I captured something on these trips…some I can hardly remember! 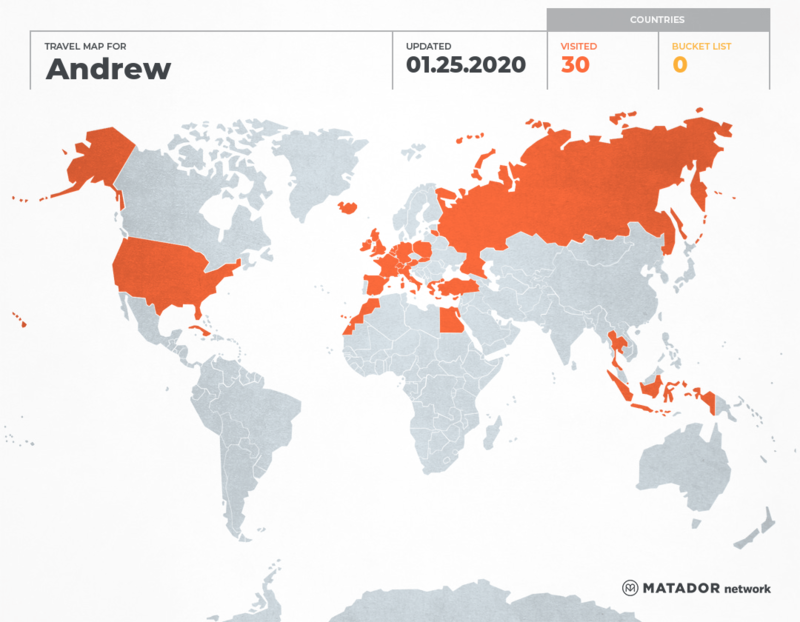 Andrew has been to: Austria, Belgium, Switzerland, Cuba, Cyprus, Germany, Egypt, Spain, France, United Kingdom, Guernsey, Greece, Indonesia, Ireland, Iceland, Italy, Latvia, Morocco, Netherlands, Poland, Russia, Singapore, Slovakia, Thailand, Turkey, United States, Vatican. Moving forward and now travelling for OUR own enjoyment, we are looking for something tangible, something we can enjoy sharing with guests. I have been looking for a World Map Pinboard. Something like this from notonthehighstreet.com. We are yet to find something that we would be happy hanging on a wall in our home. Any suggestions welcome. It’s not uncommon to see a number of articles, statements on Twitter (or other social platforms) the DOs and DONTs of travel. Some make for an interesting read and some are a little “off the beaten track”! Throughout the years, I have done my fair share of travel. Some destinations are well-known whereas others, not so known. Throughout my travels, whether that be for personal or business, I am nearly always provided with “advice”. I would always say, listen and acknowledge but by no means run with someone elses view whole heartedly. This can often sway perception and make for not such a nice experience. Everyone is SO different and the same destination is SO different, month to month, year to year. It was the last leg of my Italian honeymoon, feeling tired and maybe a little grumpy! So, had I had a better hotel, not quite so tired and the weather was better, I may well have written a different article. I have also seen simple top 10’s of things NOT to do etc. Something like, don’t grab a cab as it’s a rip off….seriously, you may have been ripped off (and I may too) but it’s also still not a huge amount of money to save your poor tiring legs….(maybe? hell, I’ll risk it!) I was also told this about New York City. Use the tube they said, don’t use the taxis. I can tell you, I used taxis several times every day! hopping in to one of the possessed yellow beasts was just an experience in itself, let alone allowing you to see the City as you journey from one side of Manhattan to the next. I suppose, to summarise, acknowledge the knowledge that is being imparted on you but look for your own reasons wanting to travel, make mistakes, explore the surroundings and create your own unique experience. For better or worse, its your very own experience, no one can take that away and at the end of it all, you are still glad you went somewhere even if it wasnt a great journey. The other side of Pisa? Italy is one of our favourite countries that we have ever been to…. Pisa was the last leg of our Italian honeymoon and I don’t know what to have expected but I certainly wasn’t wowed and will never be returning. Unlike other cities we have travelled to in Italy, I struggled to take a photo! There was nothing I wanted to really capture. Suppose the only reason we went to Pisa (other than flying home from Pisa airport!) was that we wanted to tick off the leaning tower. Once that was ticked…well…not sure there was anything else to really look at. So, I decided to take some shots of what I didn’t expect Pisa to look like…not that I want to put you off or anything! This post may be a little unjust? After all I was only in Pisa for a day and night. My issue was that Pisa just seemed to be lazy. A little like a rebellious child refusing to tidy his room. Considering the region its in, just came across as though the city was happy to exist on handouts from its gorgeous neighbours. Sorry, Pisa, you have let us down. When I first starting taking a lot of photos (most of them tend to turn out crap! ), I would use the camera supplied USB lead and connect the camera direct to the computer. This is fine for the odd photo here and there but when you have hundreds of shots each averaging about 40Mb in size, it can be a long boring process. Not only that but what ever battery you had left in the camera has been burnt. I needed something that would speed up the whole process….hmmm what could it be?? Although USB card readers are nothing new, USB performance has improved immensely over the years. We now have USB 3 and Im not going to go in to the theoretical data transfer rates etc [YAWN], at the end of the day, the reader is only ever as good as the device its connected to i.e. if you want USB 3 performance make sure you have a USB 3 port! Anyway, I did a bit of research and came to the conclusion that the Lexar dual-slot USB 3 reader was the one for me. Now, I don’t use the CF slot but I have read that its not deep enough to secure the card without the high possibility of bending the pins. Although I don’t use it, this was one of the things that put me off Sandisks offering (read a lot of bad reviews). I have this mostly connected to my iMac and performance is blistering. So much quicker than having the camera connected direct to your computer. Not only this, but it is compact and the shot above with an SD card inserted will hopefully add some scale. This would be a nice travel companion for those that take laptops with them on their journeys. In terms of price, the best price I could find it for (even on eBay – shock!) is about £21. Some places (well known outlets) are charging more than double this…you know who you are!! So, anyway, point being, for those that take lots of photos, get a bloody card reader…it will save you tonnes of time and battery! Im Andrew and married, no kids, but have a little dog called Strudel. My wife and I have recently found the love to travel, to escape the 9 to 5 routine and experience something different. Like most Brits (I think) we have 5 weeks holiday a year. So we like to think carefully about what we are going to do with that time, and also our hard earned cash. Unfortunately for my wife, I am also a tech geek! Always looking for the next gadget. So I am sure I will pop some stuff on here about the sort of tech I buy that may (or may not according to my wife) be useful on our mini adventures. We have a few trips in the pipeline for 2015. This includes Singapore, Bali, Komodo, Krakow and maybe Helsinki (not decided yet). So Im sure I will be popping something on here come the time.